An estate plan allows you to protect your assets, secure your legacy, and care for your family. Despite the undeniable importance of an estate plan, more than half of all Americans do not even have a will, much less a comprehensive plan. You do not want to be one of the people with no estate plan, as both you and your loved ones are at risk if you haven’t planned ahead. What does an estate plan involve? How can a Lincolnshire estate planning lawyer help? An illness or incapacitating injury could result in your inability to manage your assets, with no one else to take over. If you haven’t named a power of attorney or put your assets into a living trust, there could be a period when no one cares for your property or wealth at all. Until your family is able to take control, things could fall through the cracks and the value of an inheritance could decline. An incapacitating illness or injury could leave you with no way to communicate your medical choices. If you have advanced directives, your doctors and family won’t have to guess what you would have wanted, because you will have already made your preferences known in advance. You can also name a healthcare proxy so someone you trust will communicate with your doctors and make choices that you haven’t already specified. Your decline in health could result in all of your assets being spent on nursing home care. You could end up with nothing left to leave to your loved ones if you didn’t make a plan in advance so your assets could be kept safe while Medicaid paid for your nursing home costs. Your property may not be left to your desired beneficiaries. Your estate plan should include trusts to facilitate asset transfers to new owners, as well as a last will and testament that dictates what happens to estate assets. Without a plan, intestacy laws would have applied and the state would determine how your property is divided, instead of you making the determination. There could also be fighting that reduces the value of the property, or estate taxes could be assessed and take a substantial chunk out of your assets. A power of attorney for incapacity planning so you get to choose who manages assets. Trusts, for incapacity planning (a backup trustee manages trust assets when you cannot) and for asset protection during your life and after your death. A last will and testament so you can specify who inherits assets that aren’t transferred through trusts or pay-on-death accounts. Advanced directives for healthcare so you can let your doctors and family know what kinds of treatment you do, and don’t, want. These and other legal tools can be used effectively to achieve security- as long as you get the right help from an estate planning lawyer who knows how to make Illinois law work for you. 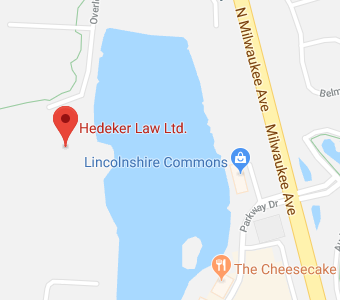 Hedeker Law is trusted by clients throughout Lincolnshire and surrounding areas in Chicago with all of their estate planning needs. Our experience and commitment to helping clients is unparalleled. Give us a call at 847-913-5415 or contact us online to find out more about the ways in which our legal team can help you.